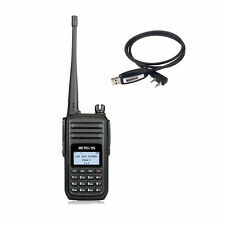 Retevis RT3S Dual Band DMR Digital DCDM TDMA Two Way Radio. It is compatible with the popular MOTO TRBO series Tier I and II using standard encryption, as well as other makes and models of DMR supported radios. Retevis T-388 is our brand new hot sale Kids Walkie Talkies.It use widely in famliy kids keeping. Kids walkie talkies are widely used in home children/kids care , It’s one kind of popular children's toys, mini appearance is children's favorite, beautiful colors also make them love it so much.The parents can contact their babies at any time when they are out of sight. PTT button lets you communicate without speaking .Wireless communication range up to 3000-8000 feet depending on environment and terrain. It is great for the yard,the house and anywhere you want to keep in touch while the kids were playing, aroud 200-300m communication distance. The extensive listening range makes it great for outdoor play and it is really a perfect choice for kids' intelligence development. The brief and fas. If you are looking for the gift for the boys up to 3 years old, the camouflage RT628 is the best choice, because it is so cool for boys to play. 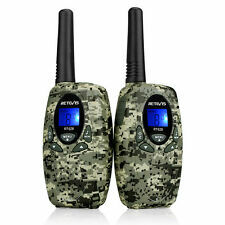 2 x RT628 Camouflage walkie talkies. It is the cool gift for boys to play, and they like the small soldier to protect the family.It also the great tool for dad to play with their kids. DMR digital two way radio, You can talk to Motorola radio. 999 Channels, Have more options Analog and digital mode combined Emergency alarm function Text message in digital mode Remote kill/stun/activate. Retevis RT-602 is your best choice: lovely appearance and crystal voice. 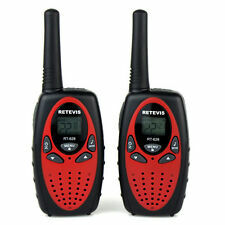 2 x Retevis RT-602 Walkie Talkies. Toy for kids to play together. It is the new tool for kids to explor the outside by them selves. Retevis RT6 is the latest developed a double period of waterproof and dustproof two way radio,IP67 Dust and Waterproof resisting two-way radio. Retevis RT6. 1 x RT6 Portable Radio. IP67 Waterproof and Dustproof. 38CTCSS/83DCS privacy code 10 Call alert tone VOX Hands-Free Operation Clear, crisp communication with easy button access Bright flashlight, quick button Support USB charging( Battery not Included). Are you looking for gift for kids? If you're searching for a gift for the little girl who has everything, Retevis RT-388 Walkie Talkies are all a perfect choice. 1.Birthday gift:The package including 1 pair kids walkie talkies, and two or more children could play together.So that it will be the great birthday gift,not only a gift,but also a education tool. 2.Christmas gift:If you have already sent a lot of the gifts for your kids,maybe it is the new choice for you,up to 3 year old girl will love cosplay with parents or her friends,so that it will be great for them. 3.Award gift:If you hope that children can learn actively,and the RT-388 walkie talkies will help them explore outdoor by themselves.And you also can keep connect with them. 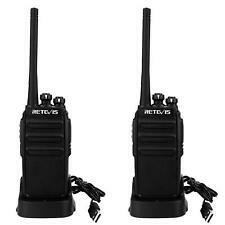 What is in box: 2 x Retevis RT-388 Walkie Talkies. Retevis RT30 kids walkie talkie,owl apperance,easy to use for kids: Novel Apperance:This RT30 kids walkie talkie has a unique and novel owl apperance,will attracts more attentions from Kids.The material is ABS,very comfortable to hold in hands. Small and cute,suitable for kids hold in the hand:This kids walkie talkie is small and compact,suitable for small hands.With belt clip which can make kids attach the walkie talkie to their school bag. Easy to use:The walkie talkie is specially designed for small children.The operation is simple,there are only two buttons,TALK button and power button, just turn on the walkie talkie,then the RT30 walkie talkie can work.Great for the little kids,even 3 year olds can easily use. 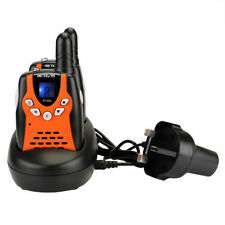 2PACK Retevis H-777 Walkie Talkies UHF400-470MHz 5W 16CH 2-Way Radio Charger. Condition is Used. Dispatched with Royal Mail Signed For® 2nd Class. 2 x Retevis RT24 walkie talkies pmr 446. What is PMR446?. Channels: 16. Weight: 193g (battery included) per piece. Size: 230 62 34mm per piece. 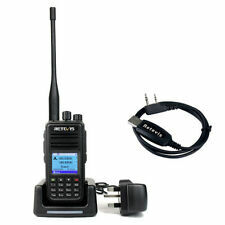 Retevis RT87 FM IP67 Dual Band DTMF Two Way Radio. 1 x RT87 two way radio. IP67 dustproof and waterproof. Any incoming call will be given priority insuring you never miss an important call while listening to the radio. Retevis RT-388. 2 x Walkie Talkies. Built in flashlight. It is great for the yard,the house and anywhere you want to keep in touch while the kids were playing,aroud 200-300m communication distance. VOX function. The RT27 walkie talkie is charged via the USB charging cable. You can charge it through various USB charging interfaces, such as car charger, USB charger, computer USB charger, mobile power and so on. Almost all USB charging jacks can be used. Retevis RT7. FM Radio(Press the monitor key to open the machine, FM radio opened). Digital FM Radio(Press monitor Open the radio). 1 x Portable radio. Battery low alert. United Kingdom. Battery capacity. Dual Band, Dual Display, Dual Standby 7W output power,High/Medium/Low power selection,Far communication distance VHF UHF Battery capacity increased, the use of longer Clear voice, exquisite workmanship, feels comfortable FM radio 65-108MHz(Only commercial FM radio reception) DTMF function,1750Hz tone, VOX, Alarm function, Scan function. Retevis T-388 is our brand new hot sale Kids Walkie Talkies.It use widely in famliy kids keeping. Kids walkie talkies are widely used in home children/kids care , It’s one kind of popular children's toys, mini appearance is children's favorite, beautiful colors also make them love it so much.The parents can contact their babies at any time when they are out of sight. PTT button lets you communicate without speaking .Wireless communication range up to 3000-8000 feet depending on environment and terrain. It is great for the yard,the house and anywhere you want to keep in touch while the kids were playing.The extensive listening range makes it great for outdoor play and it is really a perfect choice for kids' intelligence development. The brief and fashion design is little and exquisite，Small. 5 colors Retevis RT-388 to choose. 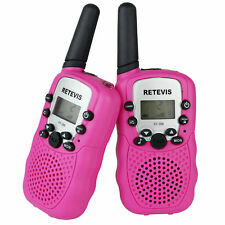 Retevis RT-388 Kids Walkie Talkies. 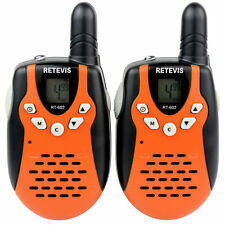 2 x Retevis RT-388 Walkie Talkies(Black ). Kids walkie talkies for boys. Walkie talkies for girls. The small and portable walkie-talkies feature 8 PMR channels and 10 Call tones,Keystroke Tones Get audible tones with each key press for response confirmation,roger beep tone, and Power Saver Circuitry that extends battery life when not transmitting or receiving.Earpiece connection can Power with 4 X “AAA” batteries (Not Included). Retevis 8 Channel Walkie Talkies:Long Range and Crystal Voice. 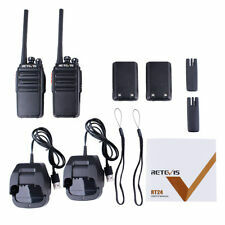 2 x Retevis RT628 Walkie Talkies. 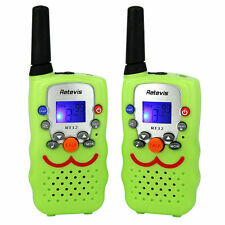 Retevis RT628 walkie talkies for kids. Retevis RT628: Popular gift. RT628 kids walkie talkies is popular for many activities. It's a good radio what you are looking for. Room Monitor help you use RT45 as a baby listener even when you are at your neighbours for dinner! Model RT45. 2 x RT45 Two Way Radio. 1 x RT45 User Manual. FM Radio(Press the monitor key to open the machine, FM radio opened) Bright Flashlight function Ergonomic design, Relatively thin body. 16 channel 50CTCSS 210DCS Scan function Battery Save Bandwidth selectable(12.5KHz) VOX function Busy channel lock English/Chinese Voice Low battery alarm Time-out-Time(TOT) Squelch adjustment function PC program protection. Retevis T-388 is our brand new hot sale Kids Walkie Talkies.It use widely in famliy kids keeping. Kids walkie talkies are widely used in home children/kids care , It’s one kind of popular children's toys, mini appearance is children's favorite, beautiful colors also make them love it so much.The parents can contact their babies at any time when they are out of sight. PTT button lets you communicate without speaking .Wireless communication range up to 3000-8000 feet depending on environment and terrain. It is great for the yard,the house and anywhere you want to keep in touch while the kids were playing, aroud 200-300m communication distance. The extensive listening range makes it great for outdoor play and it is really a perfect choice for kids' intelligence development. The brief and fash. Model: H777. Low battery alarm: Yes. FM radio: NO. Battery type: Li-ion battery. 1 × Portable radio. Battery capacity: 1000mAh. Maximum Range:1.5km-3km. Frequency Range: UHF: 400-470MHz. Feature: 16 channel 50CTCSS 210DCS Scan function Battery Save Bandwidth selectable(12.5/KHz) VOX function Busy channel lock Scrambler English/Chinese Voice Low battery alarm Time-out-Time(TOT) Squelch adjustment function PC program protection. Licence-free walkie talkies PMR 446, 0.5w output power, fixed antenna these technical parameters make Retevis RT24 walkie talkie a completely legal radio in UK and Europe. What is PMR446? PMR446 (Personal Mobile Radio, 446 MHz) is a part of the UHF radio frequency range that is open without licensing for business and personal use in most countries of the Europe area. Retevis RT24 walkie talkies is such a professional radio, which you can rest assured to use and no need to worry about the license problem. 1. With a UK charger and replacement batteries, Convenient charging. You can charge the two radios at same time; 2.Small and exquisite, Fashion and lovely, most suitable for children's gift and Rich functionality also allow you use them as a short range ham radio 3.Vox function help you easily transmitted signal through voice without press PTT key. 4. Built in flashlight make it not only a radio but also a little electric torch. 5.CTCSS/DCS function keep you away from receiving irrelevant calls. Retevis RT7. VOX(voice operated transmission. Channel capacity. Modulation Mode(W/N Band). Inter modulation Interference Resistance. Ergonomic design, Relatively thin body. Voice prompt(English/Chinese). ). Eye-catching Appearance, Lightweight, Widely Applied Light weight and thin body is great for outdoor use (cycling, riding, hiking, camping), and business use (transportation /public safety/hotel/retailing/manufacturing/warehouse industries). It can be used as a consumer radio for all ages: easy operation, well made in detail, and fashion appearance. Effective Talkback Range Normally, the ideal communication range is 1-1.5 km in urban areas, 2-3km on open area, this subject to the environment you located and whether there has interference around you. 1000mAh Li-ion Battery Rechargeable 1000mAh Li-ion battery, charge 3-4 hours for 8-9 hours continuous use. Selectable Output Power 1W-3W selectable output power enable you switch the proper output power according to the actual situation; Hi. This is the newest professional analog two way radio, stylish appearance, comfortable feel, rugged enclosure, wear resistance, not easy to scratch. Two way radio transmit power actual test 2.5W, the actual capacity of the battery labeled. Retevis RT81. High power, RT81 equipped with high power emission,Center frequency point test 10W power, increase the communication distance. Encryption (This function can only be used between RT81 radios). Retevis RT388 Kids Walkie Talkies PMR446 8 Channels Flashlight VOX 10 Call Tones Children Walkie Talkie Boys Girls Toys Gifts for Kids Biking Camping and Other Outdoor Activities (Yellow,1 Pair). Made with durable material will extend service life;Clear sound and good reception make kids have fun with their partners by this walkie talkies. Retevis RT50 with digital and analogue mode two way radio, Using TDMA technology, designed with Tier II,AMBE vocoder, compatible with mototrbo etc. DMR two way radio. Digital tube character function, easy to observe radio status. IP67 waterproof and dust-proof function allow you use them anywhere without worrying the surrounding environment.